Over the last three years, workers at Golden Farm Supermarket in Brooklyn, NY have worked successfully with New York Communities for Change and the local community in Kensington to force their employer, Sonny Kim, to pay minimum wage and to recognize their union, the Retail, Wholesale and Department Store Union/United Food and Commercial Workers (RSDWU/UFCW). At the beginning of this process, stock workers were making less than $4.50 an hour; they now receive the legal minimum of $7.25. But they are still without a contract, with no sick pay, no vacations, no disciplinary/grievance procedure, nothing to prevent Mr. Kim from firing any of them on the spot with no justification. The workers are mainly Mexican immigrants, and the owner assumed that the fact that they did not speak English would make them ill-informed about their rights. The stores manager, Steve Kim, told a reporter, ”The Spanish guys don’t know English writing and reading. How would they know American labor law?” (NY Daily News, 2/9/12). He also believed that it would keep them isolated from the community – which is native born American, Russian, Bangladeshi, Polish, and many other nationalities – but he has been proven wrong on both counts. Initially, the workers pursued their struggle through the union and the courts, filing a class action lawsuit for back wages owed and attempting to use that as leverage to pressure Mr. Kim into signing a contract. When that failed, they turned to the local community. Over the course of the last year, local members of Socialist Alternative have joined literally hundreds of others from Kensington for protests at the store. Since August 2012, there has been a boycott which has cut sales by as much as 30%. These community actions even led to the founding of a local Occupy Wall Street offshoot, Occupy Kensington, which continues to organize for Golden Farm workers but is also engaged in other issues, from policing to public space. This small struggle in my neighborhood is reflective of changes happening throughout the country. Increasingly, marginalized minimum-wage and immigrant workers are prepared to step up and fight for their rights. As one of the Golden Farm workers said, I want my brothers to know that we can stand up. We have lived in the shadows too long. Golden Farm is one of many local struggles by low-paid workers that have occurred in New York in the past year. At the same time, although the occupation of Zucotti Park is over, the effect of Occupy can still be felt. It has opened up a space for protest and political discussion that did not exist before and which has helped us build the community support for the Golden Farm workers. As Justice goes to print, the workers have suspended the boycott at the request of their union because they believe that they are extremely close to achieving a contract. This is a potentially risky strategy, and community supporters must keep pressure on Kim and on the union to make sure that a contract is achieved. 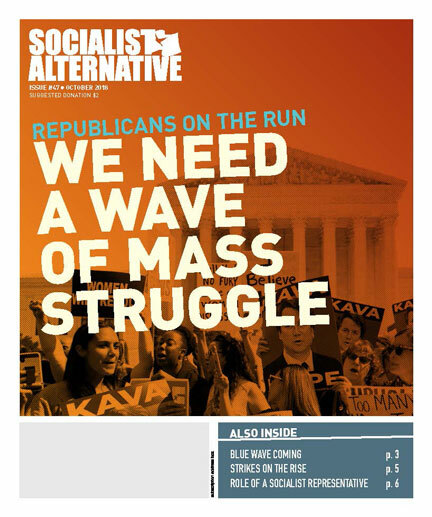 Socialist Alternative is calling on boycotters returning to the store to keep their receipts, both as a way of proving that his business has returned – a precondition of his to reinstating workers hours that he cut – and so that we can demonstrate to him that his shoppers are prepared to return to a boycott if he doesn’t deliver on the contract.